Great villa for 8 persons with a fantastic garden, fixed barbecue, terrace and a basketball hoop. 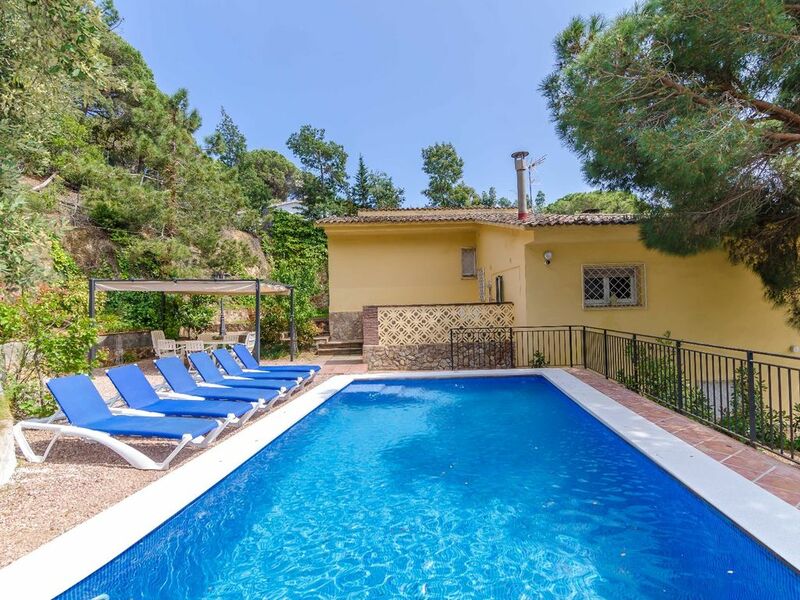 The villa has 2 independent living areas with 2 living rooms, 2 open kitchens, 1 dining room and a balcony, to spend the ultimate holiday near Lloret de Mar together. Come to Spain and discover all the beauty the Costa Brava has to offer! A villa with a magnificent view of the green forested hills. So enjoy the rich historical culture, beautiful flora and the varied kitchen of the Costa Brava, and book Villa Kartama. Kartama is a fully detached villa with 2 independent living areas along a quiet street and within walking distance of the beach. The entrance is on the second floor, which can be reached via a short staircase upwards. When you enter the house you will find the living room with hearth, open kitchen, dining room, 3 bedrooms and 2 bathrooms. On the ground floor you will find another living room, open kitchen, 1 bedroom and 1 bathroom. From the living room you can access the balcony. The kitchen has been equipped with all comforts with a 4-ring cooker, a dishwasher, freezer, fridge, toaster, microwave, oven and a washing machine. The interior of Villa Kartama is Spanish and practical with a bright and homely appearance. Are you convinced yet? The presence of a basketball hoop, fixed barbecue, hearth and comfortable seats should do the trick and convince you to book this fantastic villa. This villa is popular with larger families. So book soon and come and enjoy all the comfort and freedom! The villa neighbourhood of Font de Sant Llorenc is located along the coastline from Lloret to Tossa de Mar. Lloret is only 3km from Font de Sant Llorenc. From the villa neighbourhood you have an excellent view of the Mediterranean Sea and the green hills. Water, the symbol of life, is the essence of Lloret. De white beaches, the crystal clear water, bays and coves make this destination ideal for rest and relaxation, and to enjoy the sun and many activities. Beautiful landscapes, steep cliffs, gorgeous coastal paths and small jagged corners. In Lloret, nature has the perfect place to bloom into its full potential. The many hiking trails offer a unique opportunity to explore the natural and cultural heritage of Lloret in a quiet and calm manner. Some of the special priceless qualities of the area are the various coves and bays which are part of this wild and untouched nature. The nightlife in Lloret de Mar offers many possibilities, try your luck at the casino, enjoy a good concert on the beach, attend a show or popular a festival, or go for a quiet walk on the moonlit promenade. Definitely visit the Santa Clotilde gardens, these date back to the beginning of the 20th century. The historical and natural space is perfect for relaxing and reinvigorating one's self. A gorgeous combination of staircases, fountains, plazas, mermaids and viewpoints in the middle of diverse Mediterranean trees and plants. The gardens are in an excellent location with an impressive view of the Mediterranean Sea.